We can all go to sleep tonight secure in the fact that Kingdom of the Crystal Skull was a pretty big piece of crap. 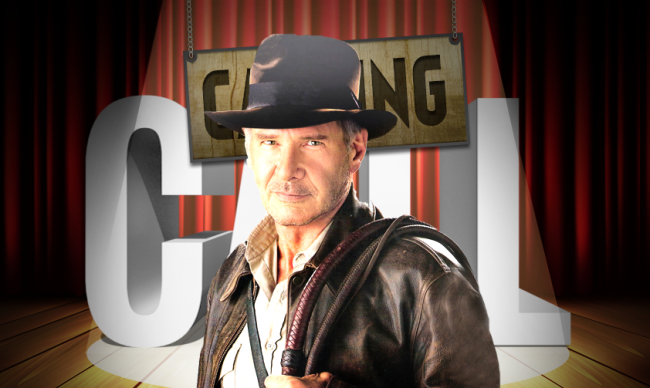 It's unfortunate that Indiana Jones and his franchise were stained by such an overblown, nonsensical fourth outing, but if there's a silver lining to this stormcloud it is that Harrison Ford and Steven Spielberg have quietly disavowed their involvement with it and have put the series on indefinite hold. Meanwhile, series producer Frank Marshall has recently declared that Indiana Jones can never be recast like James Bond, and has directly responded to all those "Chris Pratt as Indy??!!" speculations with a flat no. Those three are the effective gatekeepers to the franchise as we know it. And as long as they remain embarrassed and cynical about the last attempt, we can be sure we won't get another. Or, at least, we won't get another from them. You see, Disney owns Indy thanks to their purchase of Lucasfilm and you can be sure that if Disney paid for it they will certainly make it a movie. Just ask Thor, the Guardians of the Galaxy, and Doug Funnie after he was transferred from Nickelodeon to ABC. So, inevitably, there's someone over at Disney trying to find a way to keep Spielberg and Ford and make all the money ever with Indiana Jones and the Ill-Advised Fifth Film, and across the hall from them there's another team hoping that Ford, Spielberg, Marshall, and George Lucas will all be senile or dead in time for a re-cast or reboot. Suffice it to say, the best possible option is to just stop making Indiana Jones movies now, but that's not actually an option because money. Let's just get this out of the way now, shall we? Pratt would make for a really fun Jones. We know that he's capable of cheeky one-liners and punching bad guys in their smarmy fascist faces. We also know he's capable of brooding stoicism. Just look at his recent resume: a Marvel franchise where he's essentially playing a Gen-X Han Solo, a gigantic reboot of an action franchise based on paleontology, a soldier on a mission to find Osama bin Laden, and... well, Andy from "Parks and Recreation." But still! The only thing that Harrison Ford has that Pratt doesn't is the bookish restraint that Jones exhibits before his adventures. Soft-spoken and insisting that real archeology happens in the library doing research, this version of Jones is something I don't know if Pratt is believable doing.